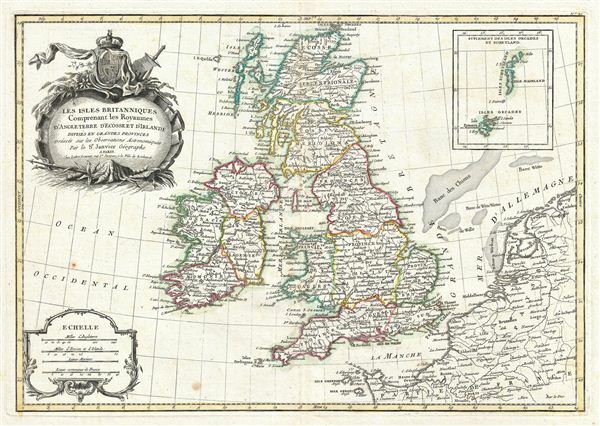 A beautiful example of Janvier's 1783 decorative map of the British Isles. Includes all of england, Scotland and Ireland as well as parts of adjacent France, Holland and Belgium. Divided according to provinces. An inset in the upper right details the Shetland and Orkney Islands. A decorative distance scale appears in the lower left quadrant. A similarly decorative title cartouche depicting the British royal armorial crest is set in the upper left quadrant. Drawn by J. Janvier for issue as plate no. 20 in Jean Lattre's 1783 final issue of the Atlas Moderne. Very good condition. Original centerfold. Blank on verso. Minor offsetting.